Read the full review at Kirkus Reviews. 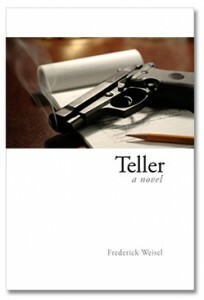 Teller: A Novel is the first novel by Frederick Weisel. On Northern California water towers, such as the one in which Charlie Teller lived. On weapons used in the novel. Frederick Weisel has been a writer and editor for more than 30 years. He lives with his wife in Santa Rosa, California. As the chapters took shape, a change came over her. It was the double-sided recognition that this book, the last that she would write, might achieve esteem and success equal to her great novel, but that its emotional heart would lie in her own unhappiness for having failed to find the one thing she wanted. For the first time she was a character in her own writing, and her frailties and mistakes were trapped on the page by the beauty and unsparing focus of her prose. Towards the end it was a battle to finish a page. The story was the story she had told herself for decades, deep within her own mind, and now as it grew, line by line, on the paper before her, she wrestled with each turn in the path all over again, as if it were still possible to change its course with the power of her words. © 2019 Frederick Weisel. All Rights Reserved.